You will want to see inside of this Fall City Horse Barn. The charming horse barn is a six stall custom wood barn that was built in 2007. The barn features cedar board and batten siding, a wash bay, four dormers, a tack room and a shed roof. The upstairs loft in the modern barn is used for hay storage and as a place to just hang out and be close to the animals. In the loft, there is a wet bar, lounge area and flat screen television for just hanging out with family and friends. The barn was whitewashed, stained, and then trimmed to match the owner’s house. 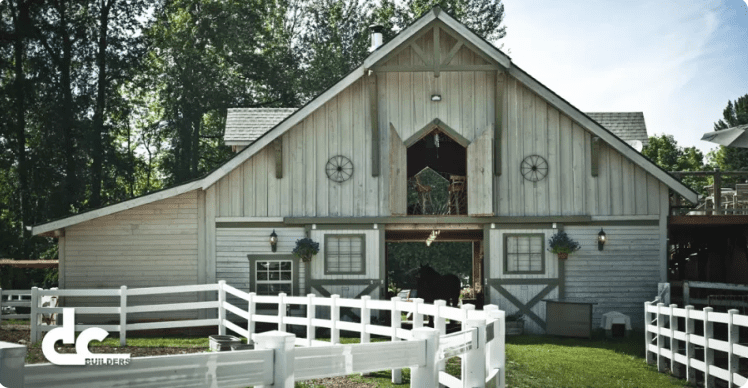 This barn is the perfect example of a multi-use barn, that is also used for weddings and parties. This barn design was built by DC Builders; they are a nationwide contracting team who specialize in the design and construction of one-of-a-kind wooden structures. The company is located in Damascus, Oregon and they have experience working throughout the country building all sorts of custom barns, homes, equestrian facilities, commercial buildings and more. DC Builders have over ten years experience providing expert craftsmanship and dedication to their clients. You will find their custom barn builds all over the country. DC Building is a designer and general contractor who travels the country building custom, quality, all-wood barns. These custom built barns add value to your property for generations to come. DC Building offers an in-house design team that will ensure you’ll be building a 100 percent custom barn that meets all of your needs. DC Builders uses only the best building materials from the great Pacific Northwest; their expert craftsmen will build a barn better, and faster. At DC Building, they are so confident in the quality of their barns that their barn buildings come with a three-year guarantee on all labour and craftsmanship. Choosing to build a custom barn on your property is an exciting decision. To start, you will have to decide what style of barn you are looking for. As a timber frame barn builder, DC Building can help in designing and customizing your dream timber frame barn. Timber frame barn structures use fewer, and larger wood posts and beams than a standard construction build. Timber frame barn structures offer increased stability and are the perfect type of build for barns. Exposed beams and open floor plans are one of the things that people love about barns. DC Building prides itself on using quality timber. They only use the highest quality of wood, combined with their top-notch workmanship to build your dream barn. Another advantage of timber frame barns is the fact that they can be built quickly, without compromising the quality of the structure. They strive on maintaining a building schedule that works with you, to make sure your timber frame barn is built in the time that is discussed. They work together with each client to design their barn build, from the layout of the barn on the property to the floor plan, to the final finishes, DC Building has the experience needed to turn your barn dream into reality. Another option when you are considering a wood barn is using a wood barn kit. A wood barn kit is a great way to get a nice looking barn without the cost of a custom barn build. DC Builders does not offer wood barn kits, but they can help recommend reputable barn kit companies that can help you achieve you barn build dreams.